CHICAGO (Aug. 19, 2013) -- Eclipse Select Soccer Club's Meg Sadera (Winnetka, Ill.) has the range to play anywhere between the defense and forward positions, and that resourcefulness will come in hany in the fall of 2014 when she plays for Colgate in the Patriot League. "Kelsey Hough said she loves it -- the school, social life -- and she reassured me to go for it," Sadera said. "I visited this spring just before we went to PDA in May (for a national showcase) and I loved the campus. I met with a lot of girls on the team, and overall there was a big balance between soccer and academics. "I'm just excited to be able to have the chance to play in college after committing kind of late," Sadera said. "It's a weight lifted off of my shoulders." CHICAGO (Aug. 8, 2013) -- There are those who pick up a sport late in their youth days, and then there is Eclipse Select Soccer Club midfielder Addie Boardman. Having spent more than a decade focused on volleyball, Boardman made a chance to her schedule by picking up soccer. She made that decision for her junior year at LaPorte High School, and now two years later, the LaPorte, Ind., native is preparing for the 2013 campaign for DePauw's women's soccer team. "I had been a volleyball player for 12 years, but I still wanted to do a fall sport," Boardman said. "I went out for soccer, and honestly I had only played YMCA soccer when I was 5. At that time, I hated the running. But I decided to go out for LaPorte High School's team and made all-conference, which I didn't expect at all." 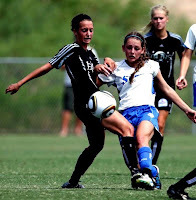 CHICAGO (Aug. 6, 2013) -- Eclipse Select Soccer Club midfielder Katy Karabetsos admits she had some good fortune on her side when committing to a collegiate program, and sure enough that pathway started in Las Vegas. Karabetsos' performance at the Las Vegas Players Showcase in March paid big dividends as the Buffalo Grove, Ill., native and member of Eclipse Select's U-17 Elite Clubs National League team caught the eyes of San Jose State's women's soccer program. After they contacted Eclipse Select President Rory Dames to get the ball rolling, the Spartans are now looking forward to having Karabetsos on the pitch starting in the fall of 2014. "It was just luck, I guess," Karabetsos said. "We were at the showcase in Vegas and their coach happened to be walking by and saw me stand out during a game. He contacted Rory and showed interest."